The rdm6300 component allows you to use RDM6300 NFC/RFID controllers (datasheet, iTead) with ESPHome. This component is a global hub that establishes the connection to the RDM6300 via UART and translates the received data. Using the RDM6300 binary sensors you can then create individual binary sensors that track if an NFC/RFID tag is currently detected by the RDM6300. See Setting Up Tags for information on how to setup individual binary sensors for this component. id (Optional, ID): Manually specify the ID for this component. 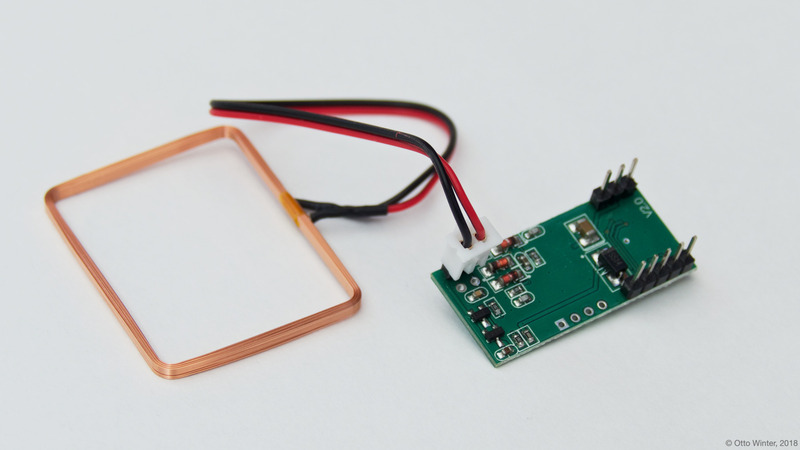 The rdm6300 binary sensor platform lets you track if an NFC/RFID tag with a given unique id (uid) is currently being detected by the RDM6300 or not. uid (Required, integer): The unique ID of the NFC/RFID tag. To set up binary sensors for specific NFC tags you first have to know their unique IDs. To obtain this id, first set up a simple RDM6300 configuration without any binary sensors like above. Then copy this id and create a binary_sensor entry as in the configuration example. Repeat this process for each tag.